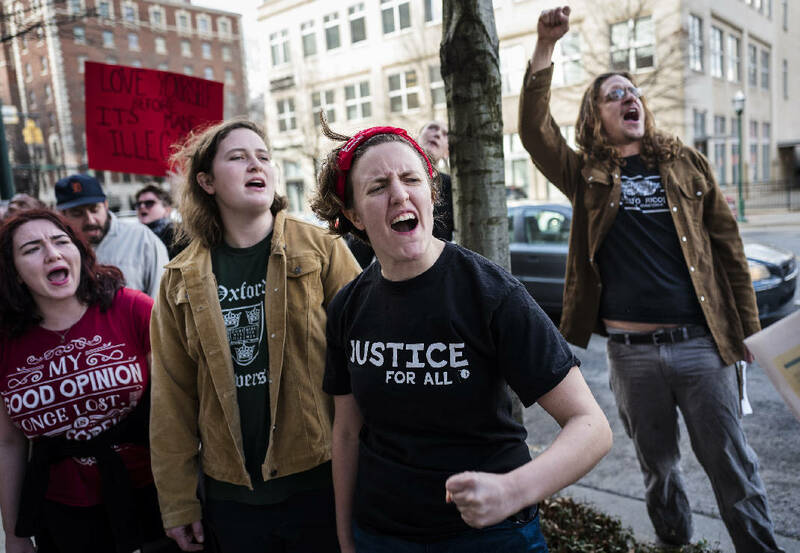 Emily Rowcliffe, Marianne Sanders, Kelly Ann Graff, and Nathan King, from left, chant during a protest outside of EPB headquarters on Martin Luther King, Jr., Boulevard directed towards Sen. Bob Corker's office on Friday, Jan. 20, 2017, in Chattanooga, Tenn. Demonstrators from Concerned Citizens for Justice gathered for a "Resist Trump Rally" to protest the inauguration of President Donald Trump and several of his cabinet nominations which Sen. Corker will oversee. In Nashville, anti-Trump protesters gathered at the state Capitol. Several were arrested by Tennessee state troopers. Protesters gathered in cities across Tennessee on Friday in opposition to the inauguration of President Donald Trump. In Chattanooga, members of Concerned Citizens for Justice and a couple of dozen other protesters waved signs and flags while chanting "Not my president" on the sidewalk in front of the EPB building downtown. While the demonstration was kindled by Trump's inauguration, Nathan King, a member of CCJ, said there were other objectives, as well. He said protesters were trying to "bring local attention to more than just Trump." Specifically, he said they were calling on Sen. Bob Corker, R-Tenn., to reject several of Trump's cabinet appointments, including Rex Tillerson, Trump's nominee for secretary of state. Corker has "every reason to oppose these appointments," King said. In Nashville, several protesters were arrested by state troopers after they chained themselves to the doors of the Tennessee Capitol. Troopers and firefighters used shears to cut the protesters loose from each other, and they were carried down the building's southern steps to waiting sheriff's vehicles while other demonstrators chanted and shouted. The public entrances to the Capitol were dead-bolted while the protest was going on. Once the arrested protesters had been driven away, most of the remaining demonstrators left the Capitol steps and headed back to the plaza across the street. Earlier in the day, hundreds also sat in silent protest at a Nashville park while Trump took the oath of office. Those gathered at Centennial Park took a 10-minute pause from talking as they declined to watch or listen to Trump's swearing-in. Organizers led a prayer, sang patriotic songs and read the Declaration of Independence aloud. Barack Obama, Hillary Clinton and Bernie Sanders shirts and buttons were scattered throughout the crowd. Two counterprotesters nearby broke the silence by shouting into megaphones religious messages against homosexuality, abortion, Democrats, feminism and transgender people. 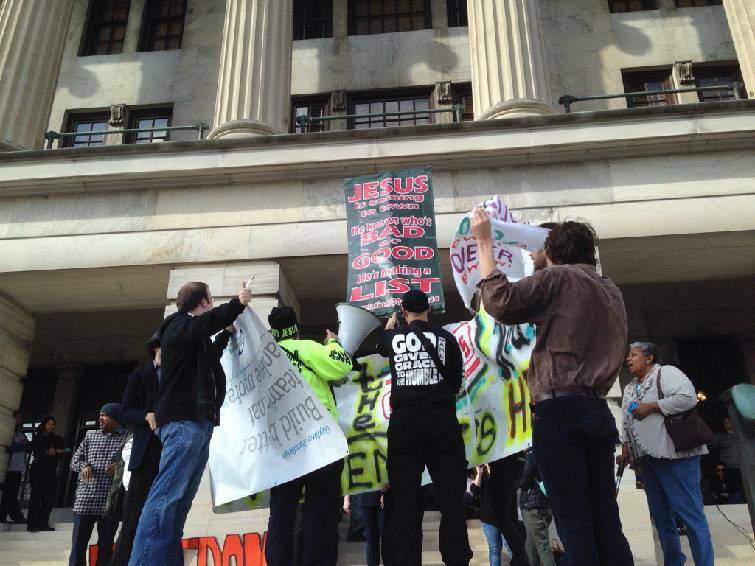 Some event attendees responded by surrounding the protesters and singing them songs. Bruce Dobie, an event organizer, said the only correct response to Trump's divisive rhetoric is silence.